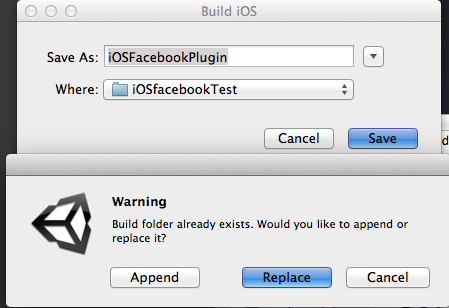 Error building Player: FileNotFoundException: Could not find file "/Volumes/MacintoshHD2/ProgramSource/iOSfacebookTest/Unity3DFacebook/Temp/StagingArea/iPhone-Trampoline/Unity-iPhone.xcodeproj/sanghakahn-mac.pbxuser". 어느날 갑짜기 잘 빌드되던 페이스북 플러그인 프로젝트가 위와 같은 오류와 함께 빌드가 안되더군요. Error building Player: FileNotFoundException: Could not find file "/Volumes/MacintoshHD2/ProgramSource/UnityiOSInAppTest/Unity3DiOSInApp/Temp/StagingArea/iPhone-Trampoline/Unity-iPhone.xcodeproj/sanghakahn-mac.pbxuser". 왠걸? iOS 인앱 플러그인 프로젝트도 같은 에러로 빌드가 안되네요. 구글링을 해보면 Temp 폴더를 지우면 된다고도 하지만 되지 않더군요. 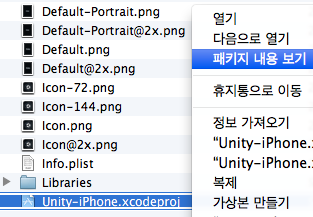 일단 command + b를 눌러 메뉴얼 빌드를 시도할 때 기존 xcode 프로젝트가 iOSInAppPlugin 이었다면 위와 같이 임시 폴더로 하나더 빌드해줍니다. 임시 iOSInAppPluginTemp xcode 프로젝트가 생성되었습니다. 안에 있는 자신의 맥 환경에 맞는 username.pbxuser 파일을 복사합니다. 그리고 기존 xcode 프로젝트 폴더의 같은 파일을 패키지 내용 보기로 해서 안에 복사해주면 이상없이 빌드가 됩니다. 위와 같은 과정이 불편하신 분들은 그냥 메뉴얼 빌드시 Replace를 하면 되지만 이경우 기존 xcode 프로젝트의 소스나 기타 리소스들이 초기화될 수 있기 때문에 조심해야 합니다. 잘 백업을 한 후 Replace로 빌드 후 다시 임포트를 하던 해야겠죠.